In my quest to be healthy and eat healthy I found a recipe for Macro Bowls on Pinterest about a month ago. Well, it wasn’t really a recipe, it was more of an idea to make lunches for your work week with five or six really heathy ingredients put together. I’ve been cooking food for the week all at once since I’ve lived by myself in college, but the idea of a macro bowl was new to me. I usually make a dish – lasagna, turkey meatloaf, something in the crockpot – and pack sides like an apple, veggies, etc. The website I found on Pinterest basically says to cook up two vegetables, a starch, a bean and a protein. 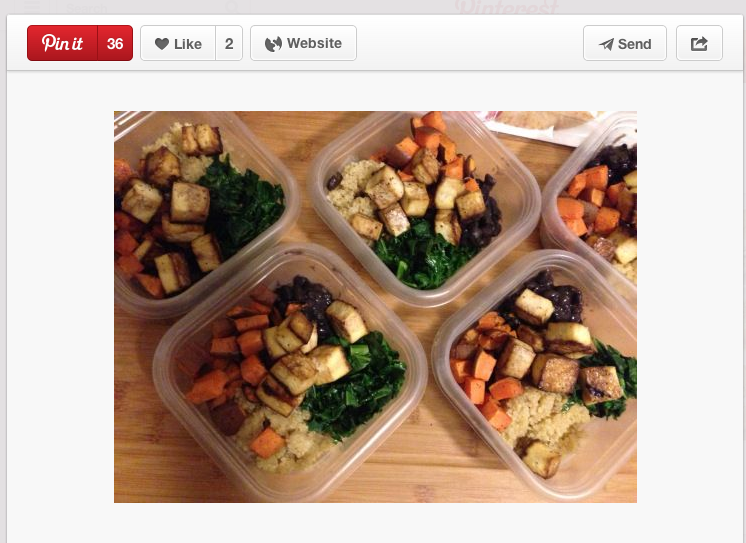 They used kale, sweet potatoes, black beans, quinoa and tofu. Other than making lunches super easy, the goal of a macro bowl seems to be making lunches super tasty and healthy too. I’m not sure on the calorie count of the macro bowls on the website but it couldn’t have been very high. When I decided to try making macro bowls I didn’t follow their recipe. I just focused on what super healthy ingredients I actually like and my favorite flavors (garlic, olive oil). 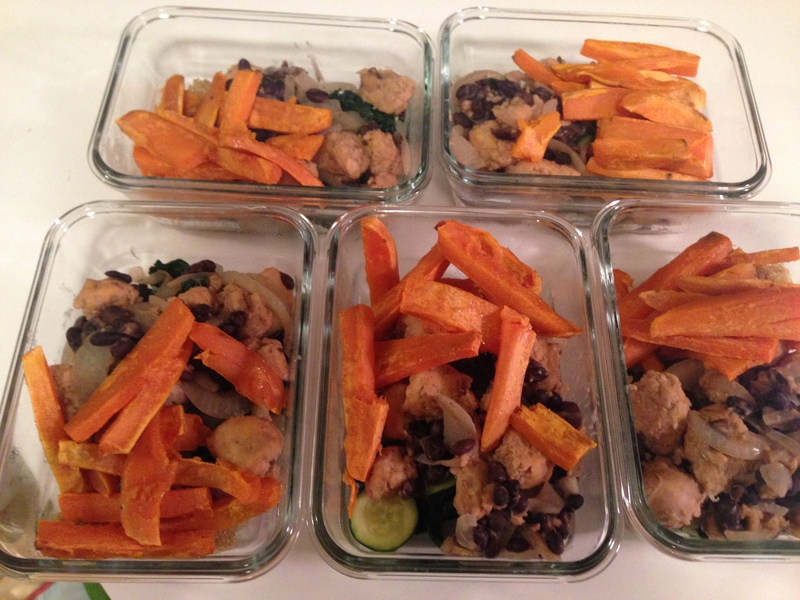 My first set of macro bowls had sauteed kale with zucchini, onions and garlic, quinoa cooked in water with garlic salt, sweet potato wedges roasted with olive oil and garlic, and some low-fat chicken sausage cooked with black beans and garlic. The sauteed vegetables were super easy and very tasty. The quinoa added a good base for the dish. 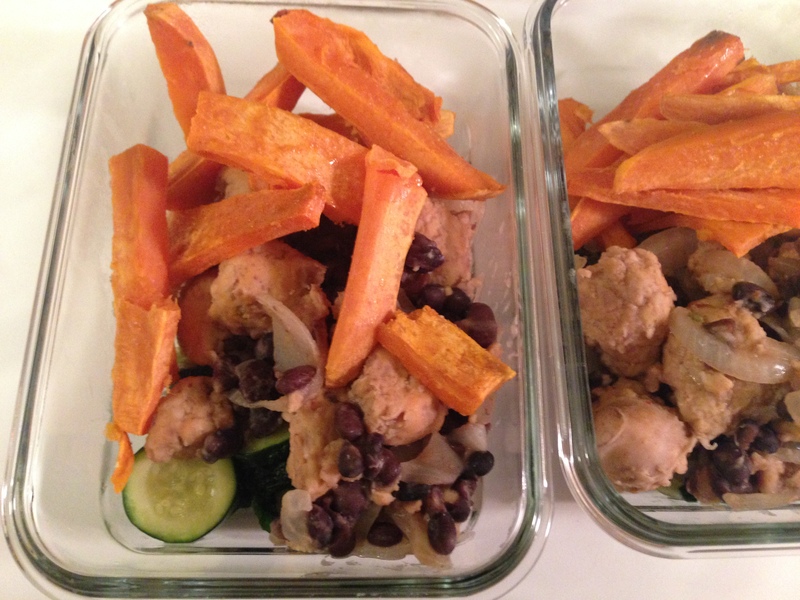 Sweet potato wedges are one of my favorite foods! Most people eat them sweet with sugar or brown sugar, but I think they are best with a little garlic salt and olive oil. For the chicken sausage I peeled off the casing and cooked the chicken like it was ground beef with the black beans. 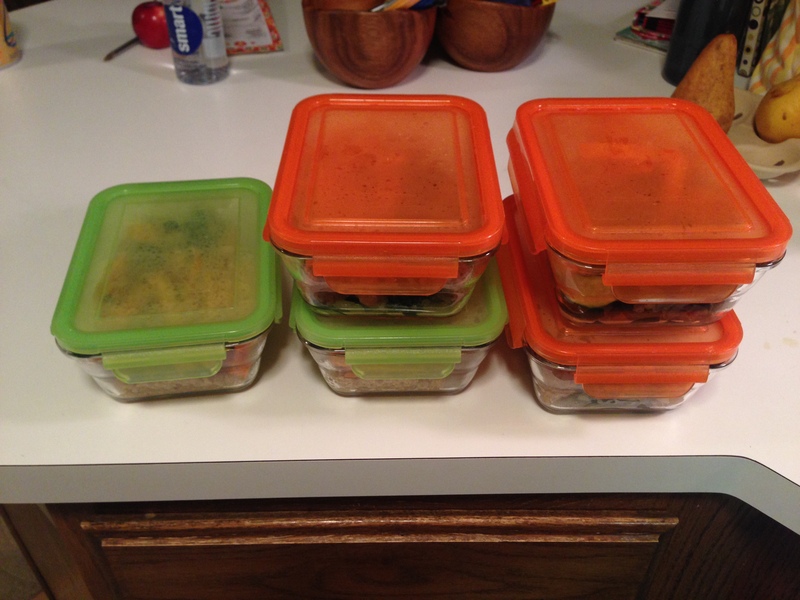 I layered all of these different pieces in to-go lunch containers and had five lunches for the week. As for the details: I used one pan to cook the three stove-top layers and then roasted the sweet potato wedges in the oven, which was great because who likes to do dishes!!?? When I divvied out the ingredients I measured how much was going into each bowl so I could plug that information into my calories app on my phone to see what I was eating in numbers. According to my app, each bowl I made had 280 calories and 22 grams of protein. I work nights so my “lunches” are actually my dinners and typically you want to eat a high-protein low-calorie dinner to keep you full but not weigh you down. The best part of the macro bowl was how easy it was. The longest part was cooking the quinoa – it takes about 20 minutes on the stove, but now you can buy precooked quinoa that you just have to heat up, so that could decrease the time it takes to make the bowls. 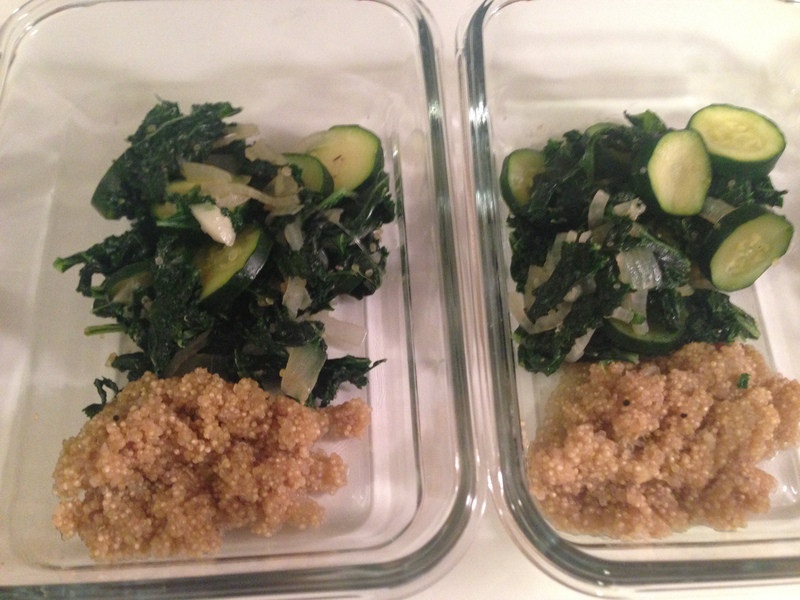 For my second attempt at making the bowls I eliminated the quinoa (mainly because I didn’t have any in my cabinets). 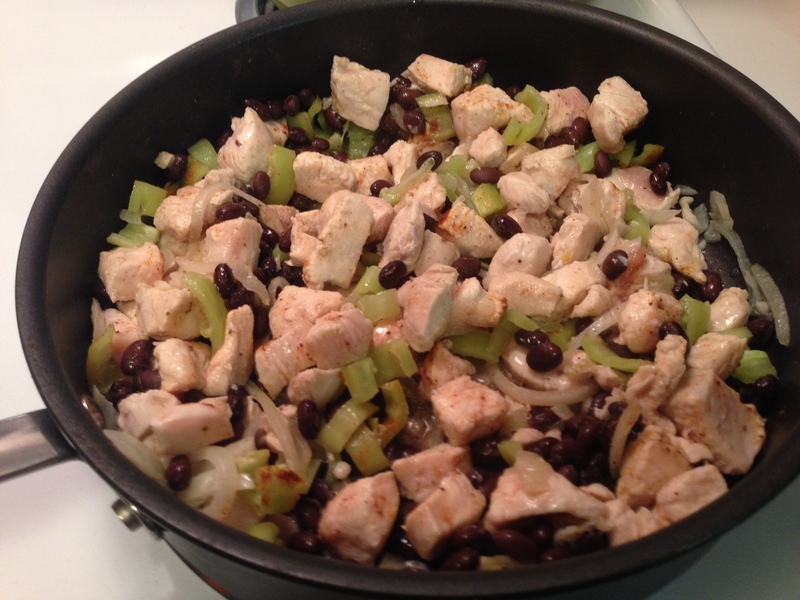 Instead of chicken sausage I sliced up chicken breasts and cooked them with onions, spicy banana peppers, garlic and black beans. Instead of sweet potato wedges I steamed a small butternut squash and then mashed it with garlic and olive oil – very similar in taste and health benefits! I made the kale the same way but instead of including zucchini I steamed some brussel sprouts sprinkled with garlic salt – I love brussel sprouts! My second attempt took less time because I didn’t make the quinoa, and I still only used one pan to limit the amount of dishes. This time, my macros had 225 calories and 17 grams of protein. 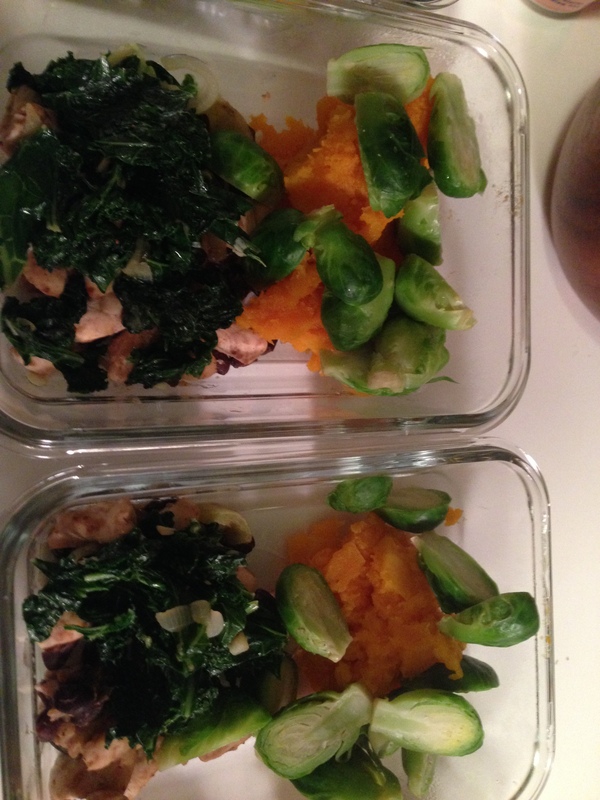 FOODNOTES: The goal of a macro bowl is to make lunches super easy and super healthy. The best part about the macro bowl is you can make it however you want. If you don’t eat meat use tofu. If you don’t like kale use broccoli. If you don’t like quinoa use brown rice or eliminate it all together. Macro bowls could also follow different flavor profiles. Obviously I’m a garlic girl but you could make a miso dressing or a peanut sauce to drizzle over the bowl for an Asian feel – both of those usually have low calories and the peanut sauce would add protein! I love how customizable these are, and that they ideally have less than 300 calories for so much food! Just curious did the last day of the week’s lunch get mushy? Did it still taste good five days later? The ingredients never got mushy and they tasted the same as the first day, but I do usually get sick of it by day 5!